A Lightning Cycle Dynamics F40 competing in the ultra-marathon Race Across America in 1989, completing the course in a record 5 days and 1 hour. They say that the support van sometimes had trouble keeping up. Lightning Cycle Dynamics has been refining their product since the beginning of the Human-Powered Vehicle movement in the 1970’s. They focus on a short wheelbase design, but their patented design is different from all other SWBs. The Lightning seat is more upright, giving better leverage to push on the pedals. The handlebar riser is stiff, which makes it heavier than other designs, but it lets the rider pull for more leverage. The seat is firmly attached to the frame, making the drivetrain stiffer. 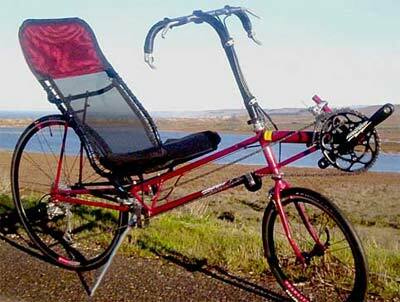 On recumbents, the seat is a part of the drivetrain. Fixing its position optimizes weight distribution between the wheels. Leg length is set by a telescoping boom. The upright seat position elevates the rider’s eyes and sets them farther forward, optimizing this design for performance city commuting. The California Highway Patrol ceremonially hassles the Lighting racing team for being the first to break the 55 mph limit in 1979. The Lightning handlebars stand a little higher and closer to the rider’s chest, so it is easier to pedal through a tight turn. This is a useful feature for urban riders. Another practical feature for the urban rider is that it can be loaded onto the Sportworks racks used to carry bikes on the front of a city bus. Smaller riders can get a Lightning with a 349mm 16 inch front wheel. 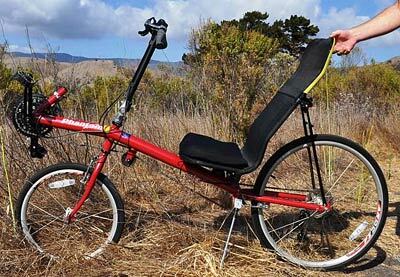 While other manufacturers have pursued big wheel high-racer designs, Lightning has not only stuck to the classic 20″/26″ combination but also offers a 16″/26″ model for really short people who want speed. We appreciate it when a manufacturer makes a point of accommodating riders at the ends of the fitting scale. With all these practical features you’d think that sporty commuting bikes was Lightning’s main thing, but it isn’t. Racing bikes are their thing, and they just happen to be really good city bikes when equipped for that job. Lightning’s racing bikes require a lot of specially sized parts fitted for the rider. This makes them a little difficult to keep in a showroom. But the Phantom is an affordable, adjustable model, so it is a good way to check out Lightning’s ergonomics.